Dogs come in so many different shapes, sizes, colours, breeds, Pedigrees, stray friends… but they have one thing in common—LOVE, which is TRUE and ETERNAL… one cannot ask for more… because you get LOVE, which is UNADULTERATE, pure and in ABUNDANCE. It surrounds you, fills your heart and soul with joy. Eyes do say it all and there is no room for words! Dogs are truly special and have always stolen our heart since time immemorial. They protect us and with their amazing skills, they help us in more ways than we can think. Their nose power, hearing abilities, brave-hearts enable them to do and perform so many activities, which I would say is not only HARDWORK but HEARTWORK. They feel happy in performing and pleasing us. They leave no stone unturned to help us—from jumping off a helicopter to save a life, working as search and rescue dogs, guide dogs, mobility assistant dogs, police dogs in war zones, etc. Learning with our Friends4ever is funtastic too, because they teach us everything so naturally. With children, they have one of the best bonds – children learn so much – compassion, kindness, responsibility, communication, friendship, so much more… and most importantly, to give and get LOVE. We have recently launched a workshop to sensitise kids to dogs’ special abilities and also how to be safe around them. Children were truly amazed on seeing dogs perform so many different activities. It was heartwarming, exciting and encouraging to see the little ones learning, laughing and enjoying… when they saw how capable their furry friends are. Get a daily dose of fun, info and interaction by connecting with us on facebook/Dogsandpupsmag having 250,000 plus ‘Likes’ . Sparkle & the team wish you a SPARKLING festive season ahead! May the eternal HAPPINESS, HEALTH, JOY, PEACE, SUCCESS and MORE…always be with you! Sparkle’s first Diwali – the little bundle was just about two and a half months old. We tried our best to save him from the ordeal – but exhaustion & tension of the noise – led to the little one finding himself a safe corner and guess where? In a shoe where he snuggled his nose and ears in and then slept. Ever since these tiny paws came home, it’s been – FOR YOU I WILL – to keep you safe and secure at all times. Diwali, the festival of lights, brings happiness and cheer all around…but not so for the pets as they feel scared and nervous due to the sounds made by the burst crackers and the smoke that is generated. This is because the dog’s sensitivity to noise is far more sensitive than ours. And sudden sounds can make them nervous. Fireworks and loud noises can make them tremble, whine and they might try to escape, in turn, hurting themselves in frenzy, some might out of fear crouch under a bed and be afraid, and at times even – Growl, Snap or Bite – when they feel threatened. And each Dog will react differently. In times of distress to our pets & strays, due to NOISE, it is best to make sure they are safe during this time. On Diwali, keep your pet indoors and shut all doors and windows to keep away sound. Try to be with them and comfort them when required. Give them their favourite treats and keep water bowl around. Put on sounds of the television/radio – sounds which they are used to in their daily life. Besides, keep all unwanted objects like lighted diyas, crackers, decorations, etc away from their reach. Do not feed them sweets and other delicacies as it can upset their stomach. Try to stick to their daily routine, but do not take them out when crackers are being bursted. Keeping a first aid kit handy is always a good idea! And it is not just our pets who need attention…strays need it too! If possible, give them a secure place to rest, and give them food and water. Do not let anyone abuse them with crackers. For your daily dose of fun, info and interaction, connect with us on f/Dogsandpupsmag having 2,00,000 plus ‘Likes’ . Sparkle & team wish you a SPARKLING festival season ahead, may HEALTH, JOY, PEACE, HAPPINESS, SUCCESS and MORE…always be with you! Completely CANINE Crazy – Oh My DOG! We all are Truly Dog Blessed because we are all completely canine crazy and we at Dogs & Pups are really happy that you are holding our 11th Anniversary Issue – with passion, love, care and commitment together – we all will take care of our Magic Paws. Magic Paws add love, laughter, joy, meaning…and so much more. One of the best feelings I get is when Sparkle chooses me and wants to come and sit next to me. It feels like wow – “I am the lucky one” and then the endearments and gushing start from my end – which is non ending- sparkly, sparkalicious, sparky, spooky loo…and so on it goes….what Sparkle must be thinking? My momma is Sparkle struck again! My son Suhaan and I love to count the dots on Sparkle’s nose and not to forget his paws. 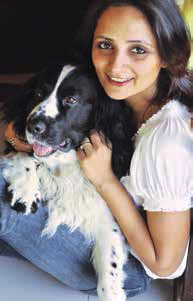 On a recent holiday when Sparkle was not travelling with us…Suhaan and I would gush after every dog – each dog reminded us of Sparkle. Sparkle’s charms are contagious as he has successfully and sometimes manipulatively captured all hearts@work too. These 11 years have turned each one in our office into an ardent dog lover, and each issue has come up with lot of love and compassion. Sparkle has always added his lucky charm to each issue. Since every homecoming is a new beginning – a beginning of wonderful companionship and togetherness – we bring you a special feature on puppies so that first-time pet parents as well as seasoned ones can take cues for being a responsible and caring pet parent and make each pet easy and comfortable. With these ecstatic feelings, we step towards another year of pooch love and let’s all continue to rejoice and feel blessed to be the chosen one. For your daily dose of fun, info and interaction, connect us on our facebook (https://www.facebook.com/Dogsandpupsmag) having 1,66,000 plus ‘Likes’. http://www.dogsandpupsmagazine.com/wp-content/uploads/2017/05/1254nal.jpg 0 0 Dogs and pups Magazine http://www.dogsandpupsmagazine.com/wp-content/uploads/2017/05/1254nal.jpg Dogs and pups Magazine2015-07-13 12:28:332015-07-13 12:34:11Completely CANINE Crazy – Oh My DOG! MAGICAL Eyes & Cuddles and MORE Splash Fun! Magical Eyes – Ever wonder why you melt, give in, or just find those drooling doggy eyes – simply irresistible? Does the gaze, the look, the melting eyes just captivate and spellbind your heart? There is no escape…best is you are happily smitten and completely under their charm and spell. Well, there’s now a scientific evidence for the same. Japanese researchers have found that dogs when they make eye contacts with their pet parents induce increased level of oxytocin in pet parents. This is very similar to the feeling that bonds together parents and children. No wonder, as pet parents, you experience so many magical moments and realise that life is about the moments which steal your heart away! Magical Cuddles – The student union at University of Central Lancashire in UK is teaming up with the charity Guide Dogs to raise money for charity and to help students de-stress during exams by cuddling a puppy in a dedicated dog room. Based on a research done in Japan that pictures of kittens and pups could increase concentration levels. More Splash Fun – Many of us take our furry kids along on vacation as we get to spend a lot of quality time with them. Every trip with them is memorable. Once on a trip to Rishikesh with Sparkle, Sparkle decided to have a swimming gala on the banks of the river Ganges. Under our supervision, wearing a harness and a long retractable leash we let Sparkle cautiously in the shallow part of the river. To my amazement, joy and excitement, Sparkle was simply ecstatic, not only was he paddling and swimming, but also diving in like an OTTER and picking up pebbles and bringing them up – ‘See mama- what I can do!’ Honestly- it did make my heart so proud, not only that while remembering this incident which was so many years back… brings a BIG sparkling smile to my heart. Yes, pets can surprise us with their skills. Those who are still hesitant to let your pooch swim can get some real handy tips in our special feature titled Swimming: A splash of fun, frolic and exercise. Let the water beauties show their skills! After all it is summer time… time to relax and chill. Take good care of your pets in this season. Sparkle and team wish you a fun-filled summer ahead and do CONNECT with us on our facebook (https://www.facebook.com/Dogsandpupsmag) having 1,45,000 plus ‘Likes’ for your daily dose of fun, information and interaction. Wishing you all happy & safe summers! http://www.dogsandpupsmagazine.com/wp-content/uploads/2017/05/1254nal.jpg 0 0 Dogs and pups Magazine http://www.dogsandpupsmagazine.com/wp-content/uploads/2017/05/1254nal.jpg Dogs and pups Magazine2015-05-18 15:04:432015-05-21 15:36:24MAGICAL Eyes & Cuddles and MORE Splash Fun! Just do it – RIGHT! Time to do the right thing and most importantTIME to say NO! As pet parents, we often go overboard in pampering our pooches. In our attempt to make them look smart and trendy, we dress them up with spectacles or human clothes. Though they may look cute and make up for some sweet pictures, they are actually very uncomfortable in human dressing. Another major mistake we do is to give them a human treat – especially chocolates…they are overtly harmful to your pooch. Some even go to the extent of spraying them with their favourite perfume, which is not at all suitable for them. Remember they are not humans and they do not need human things. And that’s not all. We even treat them like humans. We hug them, which most of the dogs dislike. We confuse them by not giving the specific commands and then expecting them to understand us. They can sense our body language – dogs know when you are happy and when you are sad. Another thing which they dislike is being patted on head/face. It disturbs them. As pet parents, we would have come across situations where we want our pooches to meet and greet strangers. Let them become comfortable and then introduce them. Whenever you go for a walk with your pooch, let him smell and explore his surroundings. He loves to do that…do not pull his leash every time he stops to smell something. Give him time…he appreciates it. Just to summarise the points, there are many more…. Say NO to dressing your dog – with spectacles or human clothes. Say NO to cruelty towards strays…. Your pooch has a short life and he deserves your love in return of the unconditional love, loyalty and faithfulness he bestows on you. Let’s equip ourselves with the right knowledge to do the right things with our beloved pooches. Our team with our pack leader Sparkle are happy that we have crossed one lakh and thirty thousand (1,30,000) ‘Likes’ on our facebook , creating a connect for doing the RIGHT thing… do connect with us on www.facebook.com/dogsandpupsmag. http://www.dogsandpupsmagazine.com/wp-content/uploads/2017/05/1254nal.jpg 0 0 Dogs and pups Magazine http://www.dogsandpupsmagazine.com/wp-content/uploads/2017/05/1254nal.jpg Dogs and pups Magazine2015-03-18 11:51:152015-03-26 17:20:30Just do it - RIGHT! Excitement & Exuberance – Each Day and Every Day! What amazes me is how Sparkle greets us ‘Good-Morning’ everyday – so much excitement and exuberance every morning. He rushes up to me and Suhaan (my son) as if saying ‘WHERE WERE YOU? I have missed you so much and am meeting you after so long’. The feeling is so special when I see my Springer spring to us, cuddle and sniff us awake. Both me and Suhaan really look forward to this. In fact, if Sparkle is somewhere in the house, one of our favourite moments is to watch him running to us when we call out for him. It’s as if ‘Wait for me – I don’t want to miss the morning ritual!’ The body language, fur, eyes, smile – all so happy, he actually leaves us “Sparklebound”. What also surprises me is how he takes up his daily activities with so much of enthusiasm and fervour. The same I have noticed with our Pariah friends – every morning starts with ZEST. It’s most heart warming when Sparkle and I are followed by the friends, who adore us! I thought may be the crux is our darling furry friends do everything in the moment. They are there and nowhere else. They do everything they want to do with so much passion, energy, enthusiasm, concentration, persistence – leaving no stone unturned – and that is the key to their contented & successful lifestyles. So as always, we commit to Happy Responsible Pet Parenting by learning and doing the right practise. We need to do simple things like focusing on their daily needs and requirements – the most important one is also to spend quality time with YOU – getting that belly rub which most of them love! It is important to note – your pet is your family member, so they are not destined to be secluded or shut in one part of your home. Also your pet needs to be free and never chained. I read a very interesting line, “A chained dog is like a chained soul.” So, always ensure they have the freedom which is their right! Another important aspect is to respect their feelings. They feel happy, sad, they get jealous, they miss – their feelings are SO PURE in every sense. Enjoy them, cherish them each day and every day! Do like our facebook page (www.facebook.com/Dogsandpupsmag) for your daily dose of fun, information and interaction and most important – CONNECT. We look forward to sharing your experience and having a platform for all people – who want to promote Responsible Pet Parenting. Sniff all the interesting and informative articles on our website (www.dogsandpupsmagazine.com) under the section ‘Article Library’. You can become a member and participate in the various interactives in ‘Readers Write In’ and see your inputs get printed in the magazine and posted on the website. Our Team with our pack leader Sparkle wish you a Funtastic, Fulfilling & Fabulous 2015. Here’s to Health, Happiness and everything which makes your Heart Happy & more…! http://www.dogsandpupsmagazine.com/wp-content/uploads/2017/05/1254nal.jpg 0 0 Dogs and pups Magazine http://www.dogsandpupsmagazine.com/wp-content/uploads/2017/05/1254nal.jpg Dogs and pups Magazine2015-01-22 13:13:092015-01-22 13:19:59Excitement & Exuberance – Each Day and Every Day! Love is all around – adopt it! Love is a loving heart, a wagging tail, a wet nose, heart melting eyes, somebody who greets you with a jump and a spring! Each one of us who has ever loved a Dog knows the meaning of unconditional love. Love is specially best when it comes to you – unannounced – this specially happens when I meet ‘STARRY’- my favourite brown and white very handsome pariah. My heart sure does smile looking at his big brown eyes! Like a cat- he goes all around me… I sure do bask in the attention I get! Then there is ‘CRANKY’ as the name suggests – he is vocal in a whining manner for whatever he wants! Some mornings when Sparkle and I go for a walk- we are escorted by Starry and Cranky- both really like Sparkle and the chemistry between the trio is quite a sight. On one such morning, Sparkle decided to have an adventure and ran off behind his lady love – little did he realise there were other Dogs. Behind Sparkle was – I and Starry- you don’t need to guess but Starry was definitely faster and chivalrously managed to ward off the other dogs away from Sparkle – meanwhile I in my full sprinting motion also managed to catch up. We sure did stir up quite a commotion, Sparkle was not happy that his rendezvous came to an abrupt end. Starry bravely saved Sparkle from getting bitten or attacked by other dogs! On many other occasions I have noticed how are stray angels actually take it upon themselves to guard their respective colonies from unwanted elements – they just can sense when things are not right and do alert the night watchman with their barks! It is indeed very heartwarming to see a lot of people – who have started working for this cause in providing homes and care for our Stray Friends. People from all walks of life are spreading compassion and kindness to make their lives better by either finding them a home, spreading more awareness through celebrity participation – providing food, water even medical care in situations. These angels are sturdy survivors – giving love manifolds. It becomes important to give them right care by sterilisation – it is very sad to watch stray pup litters getting killed and hurt by accidents and other things. Pet parents have realised that strays also form excellent pets and more and more people are adopting them as family members. Lovable and loving – they are better attuned to the environment, they have fewer health issues and are sturdy. With proper training and socialisation, they are the best pals one can have. As Mother Teresa rightly said, “Let us always meet each other with a smile, for the smile is the beginning of love”- so definitely – do greet our guarding angels with a smile and give them space in your Heart & Home! http://www.dogsandpupsmagazine.com/wp-content/uploads/2017/05/1254nal.jpg 0 0 Dogs and pups Magazine http://www.dogsandpupsmagazine.com/wp-content/uploads/2017/05/1254nal.jpg Dogs and pups Magazine2014-11-20 12:00:062014-11-20 12:53:52Love is all around – adopt it! These action and energy beings are multi talented- do read our article K-9 Superheroes with Super Powers where in you will get an insight into their tremendous capabilities. Small or large breed, pedigree or stray – they all know how to love and be loved. As pet parents there are some common mistakes which we should avoid. We talked to vets, trainers and groomers and have compiled a list of Dos and Don’ts for your pet. Pooches bring a lot of love and cheer in our lives. But, did you ever give a thought on whether your pooch is contented or not? In this issue, we also give a formula on how to keep your pooch truly contented. With festivals just round the corner, do ensure your pet’s routine is maintained. Dogs become very restless when firecrackers are burst. So, be extra cautious during that time and give them all love and support they deserve. A few tips are being shared in this issue to make festivals an enjoyable time for all. Sniff all the interesting and informative articles on our website (www.dogsandpupsmagazine.com) under the section ‘Article Library’. You can become a member and participate in the various interactives in ‘Readers Write In’ and see your inputs get printed in the magazine and posted on the website. Sniff a bit more and we will love to have you participate in our Blogs, Ask The Expert and Gift & Goodies sections on our website. Do check out our facebook page (www.facebook.com/Dogsandpupsmag) for your daily dose of fun, information and interaction and most important – CONNECT. We look forward to sharing your experience and having a platform for all people – who want to promote Responsible Pet Parenting. Sparkling Treasure always. We will love to wish your PAW’s health, happiness and more…do e-mail us their pictures and birthdates. Happy Reading…Happy Times…Celebrations and more! HEARTFELT HAPPINESS TO ALL – our team is jumping, sniffing, prancing with joy – as you hold our 10th Anniversary Edition. “Knowledge is a treasure, but practice is the key to it.” –Lao Tzu, each edition of Dogs & Pups has been bought out with passion to empower you to do the right ‘practice’ for your pet. It has been a fascinating journey of celebrating LOVE, which is unconditional, eternal & timeless. The very soul/core of our magazine is PROMOTING RESPONSIBLE PET PARENTING and it has been overwhelming to see that we share the views with so many like-minded people. Cheers to all- and hoping to see happy wagging tails, not just at our homes but also on the streets- happy. Our Heroes Our Dogs – with their abundant Love, Loyalty, Intelligence, Friendship, Bonding, Bravery, Sensitivity, Adaptability… have made an incredible mark in our heart and soul. Dogs, through time, have enriched our lives, connecting with people in different centuries, countries and people of all ages. This friendship, so true, has surely withstood with excellence- the test of time and passed with flying colours. Dating- may be 12,000 years back or more when dogs initially settled with humans, where in they would alert people to any intruder entering the camps- because of their astute smelling powers. In return they too benefitted with a safe environment and food. Dogs have had an important role to play in various cultures and mythologies. There is a depiction of dogs in various cultures- some being- Greek, Hindu and Chinese. We sure have come a long way- they have not only been companion to the elite but they have also performed and excelled in innumerable activities – protection, herding, search & rescue, hunting, assisting, companionship, etc. Currently they share our home and hearts- by giving us Unconditional Love. No wonder they have been christened as ‘Man’s Best Friend’. Hope you enjoy reading 10 Essential Life-Saving Commands, 10 Crucial FIRST AID Ways to Save Your Pet’s Life and 10 Amazing Facts About Lovable Pooches! Come sniff important information on our website (www.dogsandpupsmagazine.com) and join us on facebook (www.facebook.com/Dogsandpupsmag) for some fun and gifts. Every issue is dedicated to this bond of love. Sparkle and the team wish your furry friends and you Happiness. Let’s celebrate this bond so true. Must watch – Swedish House Mafia – Save The World, the video catches the protective instincts of dogs beautifully. On witnessing crime – one dog calls all the others – they not only save but comfort the victims. Our superhero canines – always make us happy and definitely make the world a better place! To ensure their happiness, it’s very important to learn their body language and needs – and understand what they are trying to communicate. Do read Decoding the ‘Bow’dy Talk! and Ways to comprehend canine conversations. Our loyal buddies have been with many ROYALs who have loved and adored them. The Bichon Frise was a regular member at royal courts in Europe; Pekingese were kept only by emperors, relatives and courtiers at the Imperial Court in China; Pug was extremely popular in Victorian times; Maltese were owned by kings, queens and nobility in Egypt, et al. This issue, we bring you information on two such royal hounds – Rampur Greyhound (India) and Borzoi (Russia). Both these breeds have been noble companions in different parts of the world and now lovely companions for all pet lovers alike. The summers are at its peak and it has become pertinent to keep our pooches cool and hydrated. But do we really know how much water is enough for our pooch? Sniff for answers in Why is water important for your pet? and Learn how to keep your pet safe this summer. And it’s not just the pet dogs who need our care; stray dogs need our compassion too. Provide them shade and a bowl of clean drinking water. Our next issue will be our 10th Anniversary Issue, for us it has been a journey of celebrating love which is so TRUE, TIMELESS & ETERNAL. Love expressed multiplies, we look forward to your interactions with us in the magazine and on our website: www.dogsandpupsmagazine.com. Do also log on to our facebook page: https://www.facebook.com/Dogsandpupsmag and get your daily dose of Unconditional love and Knowledge from experts – which empower us to do the RIGHT thing… for our canine protectors. Sparkle says – do practise SUNSHINE SAFETY…for all. Enjoy the summers and have a wonderful vacation and most important…write in. http://www.dogsandpupsmagazine.com/wp-content/uploads/2017/05/1254nal.jpg 0 0 Dogs and pups Magazine http://www.dogsandpupsmagazine.com/wp-content/uploads/2017/05/1254nal.jpg Dogs and pups Magazine2014-05-14 14:58:412014-05-26 16:35:05Protectors all the way!